Last weekend I taught a small class of eager quilters about how to use different threads in their machines to do free motion quilting. These were all beginners at using free motion quilting and I believe they all enjoyed the class and learned a lot. 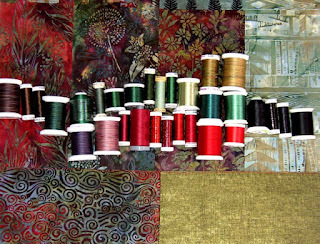 It was very fun and I felt comfortable teaching this topic as I have been doing so much quilting on my work and using numerous kinds of threads. I have since found out that others might have signed up but they thought it would be a more advanced class based on the kind of work I do, but I assured them it was a beginner class and that I would do it again if there was interest. We'll see at our next quilt meeting whether there are any who want to have me teach it again. I spent a couple of hours last week going through images of my pieces and trying to crop out a suitable image for a postcard for my solo exhibition in May. I created a half dozen images and then let them sit there for a few days as I could not decide. When I went back to them and looked through the choices I had no difficult in selecting the one to use. It was quite obviously the most eye-catching and dramatic one and really showed nice quilting, beading, and applique that was representational of my work. The gallery owner loved it so at least I have that done. The gallery owner has asked me if I would do a gallery talk during the month of my show. I have never done this, but I am certainly willing to give it a try. I get very nervous talking in front of people, but hopefully with preparation, notes, and a topic near and dear to my heart it will be ok. Hopefully someone will find my process, inspiration, and technique interesting enough to listen! I am currently working on a small piece and I have been documenting the progress with some pictures. I had a little problem with the camera, but hopefully I can get more of them posted here shortly. I believe the piece will be entitled "Blackberry" or something like that based on the fabrics and motifs on them. I am currently working on the beading. It took quite a lot of auditioning to determine what I wanted to do with the embellishment and it has taken a quite different direction than I had originally thought. You never quite know until after the quilting is done, and sometimes even after the binding is on, quite how the embellishment will take form. It is an exciting process that I truly enjoy. Currently I have a number of pieces being shown at The Frame Shop and Gallery in Hamilton, Montana. The owner of that gallery saw my work at the local fiber art show over the Valentine's Day weekend and asked me to bring some in. The fiber art show, An Affair of the heART, was a great success. I sold two pieces and they sold 21 pieces over all. There was a steady stream of onlookers and admirerers. I was fortunate to win the challenge and receive a gift certificate to use at In Good Company which sponsors the show and the TARTS (textile arts) classes I attend every month. The show was excellent and work is of high quality. I am honored to be able to exhibit with so many other talented fiber artists. If anyone happens to go to the Mid-Atlantic Quilt Festival and see my two pieces there (From Winter We Emerge in the main show, and In A Heartbeat in the Fibrations special exhibit) I would love to see how they are displayed. I've never been in this show before, although I have exhibited twice in the Denver Mancuso show. Please check out my website at heidizielinski.com and see the new quilt pictures in Gallery 2. 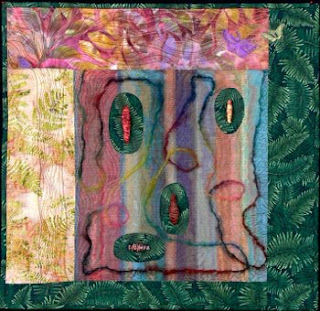 This weekend there is an art quilt show here in the Bitterroot Valley and I have entered 7 of my fairly recent works. Two of them are new ones that I just finished. Most of these pieces are now loaded on my website. The show, called "An Affair of the heART" is Friday evening, Saturday, and Sunday at the Hamilton City Hall (also called the Bedford Building). 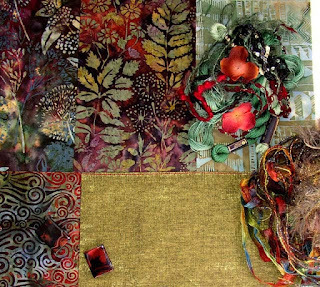 There are numerous fiber artists exhibiting their work and there is a challenge that should be very interesting. It is usually a very good show. I have one quilt in the Mid-Atlantic Quilt Festival and it should be arriving there any day. 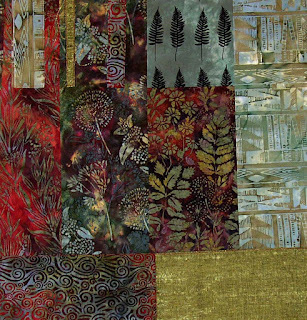 That is a national juried quilt show over in Virginia on the East coast. This is the first time one of my works has been over on the East coast. The SAQA exhibit that my piece, "In A Heartbeat", is in, will also be showing at the Mid-Atlantic Quilt Festival. That exhibit is called "Fibrations" and includes small fiber art works from artists across the country. I will be hanging a few of my pieces at a wonderful local retail furniture and home decorating store here in Stevensville called Madison Creek Furnishings. They have a beautiful inventory of furniture and accessories that I think some of my pieces will blend very well with. I need to write up labels with descriptions and prices on them and get them over to them pretty quick here. Our project this month for the textile arts class I'm involved in, is gelatin plate printing and I haven't done anything yet (class is next Tuesday). I plan to make my gelatin plate today and then will be able to do some printing in the next couple of days and maybe make a small piece from one of those. I have a print from a friend which she didn't like and made me take it off her hands. I have added to it with some Shiva paintstiks to make it hopefully a bit more interesting. Here are some of my recent pieces, which are also now on my website. 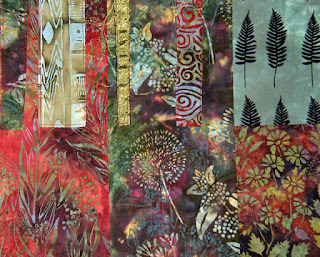 This first one was inspired by the fabric beads we made for last month's textile arts workshop. 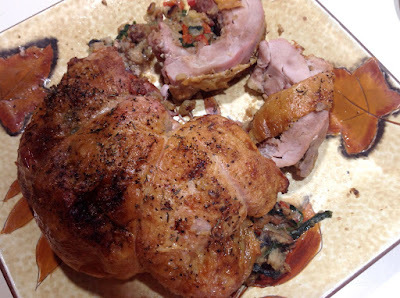 I wound materials around a skewer and then melted them with a heat gun. The materials included felt, tyvek, fabric, threads, and sheer fabric. I thought they looked like little cocoons, so this piece is entitled, "Chrysalis". 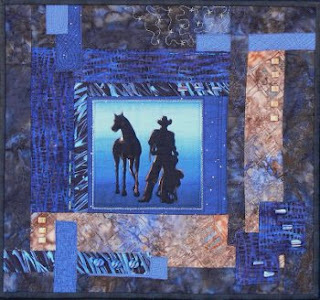 This next piece has already sold and it is called "Midnight Cowboy". I really like how it turned out. The quilting around the border started at the upper right and I went around the piece quilting a pattern that reminded me of barbed wire. when I got to the top I ran out of thread! Since I knew I could not make another thread blend and not be noticeably different, I decided to change to a metallic silver and the barbed wire pattern became a starry sky. It is really effective and was a happy accident! One week in January I decided to do some wholecloth pieces in order to work out some quilting patterns. Two pieces turned out nicely and I ended up adding some beads and finishing them. This is one of them. 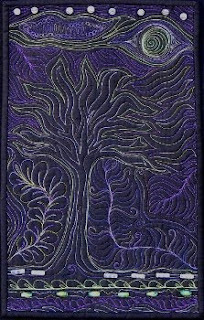 I just used a piece of black fabrics and quilted it with rayon and trilobal polyester threads including some varietgated ones. I like how the quilting is accented on the black fabric. This is a small piece, but it has great impact.